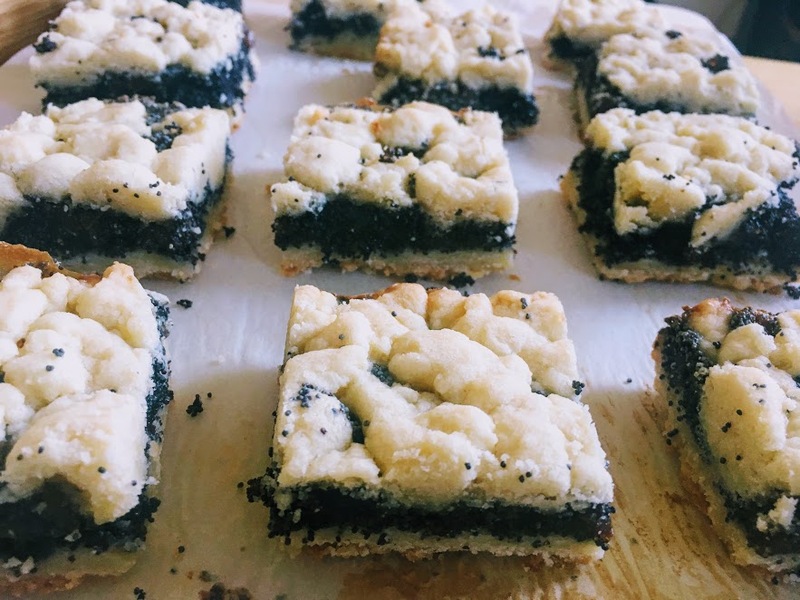 I got the inspiration for these bar cookies from a visit to a Romanian bakery in New York City, where I tried a pastry filled with a thick layer of poppy seeds. Popular in Eastern European cooking, poppy seeds can be sprinkled on bread rolls, mixed with noodles, or combined with milk, sugar, and other ingredients to form a filling for strudels and cakes (such as flodni, a Hungarian dessert with layers of apple, walnut, and poppy seeds.) I jazzed up my filling with vanilla extract and a handful of dried apricots, which add bursts of tangy sweetness, and sandwiched it between layers of buttery shortbread. Prepare the crust: Preheat oven to 350 degrees, and grease or line a 10 x 10 inch pan with parchment paper. In a large bowl, cream together butter and sugar until light and fluffy, around 1-2 minutes. Add salt. Stir in flour, mixing until just incorporated. Press half the dough into the bottom of the pan, and poke holes throughout the dough with a fork. Set aside remaining dough. Blind bake crust for 10-15 minutes, until firm. Remove and set aside to cool. Prepare the filling: In a medium-sized mixing bowl, combine poppy seeds, milk, sugar, vanilla, salt, and apricots. Set aside for a few minutes; the mixture will thicken slightly. Spread evenly over crust. Bake: Crumble other half of dough with your fingers to form streusel-like clumps. Sprinkle over the top of the poppy seed layer and then press down with your fingers. Bake for 15-20 minutes, until edges and bottom layer are golden brown. The surface of the top layer may still be quite pale. Set aside for a few minutes to cool. Store leftovers at room temperature in an airtight container. Love the combination of flavors, looks good!